In 1640, Dutch painter Jan Brueghel painted Satire on the tulip mania where he illustrated the speculative bubble that crashed the tulip market at the time: prices for a single bulb soared, before collapsing dramatically. One day, we might have an equivalent painting for Bitcoin, but that’s another story. The Dutch have always been dead serious about flowers. The solid success of Dutch startup Bloomon is just another confirmation. 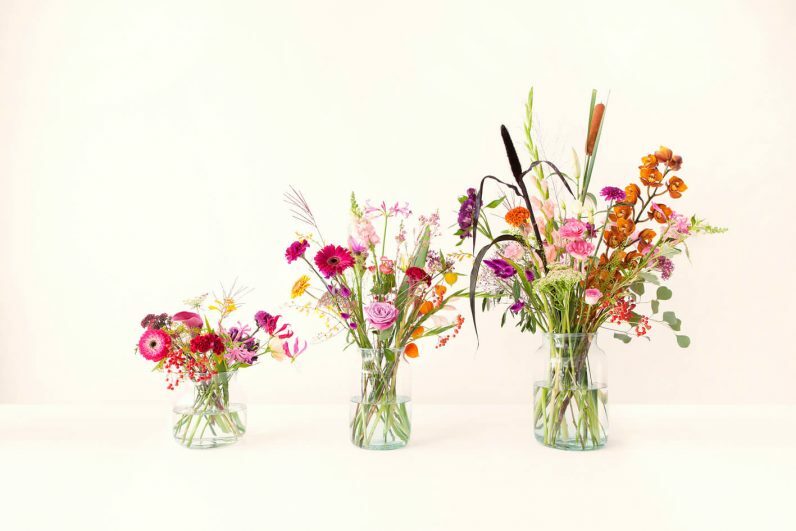 Founded in 2014 by Patrick Hurenkamp, Bart Troost and Koen Thijssen, Bloomon is a subscription service for flowers. Think of Netflix, but for hyacinths and begonias. Bouquets are designed by dedicated stylists that arrange them according to seasons and trends. The company received a warm welcome from investors. Just one year after its founding, it raised around €3,500,000 in a first funding round. In 2017 it went through a second round that brought in €21,000,000. The number of employees increased accordingly. “The first year we were six-seven people, the second 50 and now we’re already 100” says Koen Thijssen when I met him at Bloomon’s headquarters, a bright, colorful office close to the center of Amsterdam. Employees are dispersed around a single, spacious stretch of office space. “It’s completely mixed. There is no division by department. Coders sit close to stylists and seats are reshuffled every three months” adds Koen. He’s also Bloomon’s managing director and is therefore the perfect person to talk with about the company’s strategy for floral dominance. We started by talking about Bloomon’s origins. Koen Thijssen: We’re three founders: Patrick, Bart, and me. We were just randomly chatting about possible business ideas. Patrick has family in the flower market – they are growers – and he told us that it was such a complicated business with a lot of intermediary steps between grower and consumer. A flower is picked, auctioned, sent, and sometimes even re-auctioned at a local market. Such a long process for a product that has such a short average lifespan! So we wondered how we could shorten the supply chain and we started to look at the dynamics of the subscription model. How we could apply it to the flower market? And what is the answer to this question? Well, in the traditional flower market, it takes seven-to nine-days to bring flowers from one end of the supply chain to the other. We wanted to reduce it to 48 hours. First off, we needed to eliminate all the auctions in between, purchasing directly from growers. Being in control of the whole chain, we could offer them a volume estimate so they don’t have to throw away flowers that are not auctioned. Then, on the other end, we can rely on our own delivery solutions in all major cities. Anyone can sell flowers online but only Bloomon has such a short supply chain. So you’d say that this is what makes you unique? Yes, this and the flowers per se. We thought that was a product with an old-fashioned design and feel. We wanted to come up with our own style. So we hired a flower stylist to create seasonal collections that reflect the latest trends in fashion and design. These are the two axes along which we completely differentiate ourselves. Yes, that’s true! In our company, we have these two very different DNAs. On one hand, we’re a tech company. We’re data-driven. We want to automate our supply-chain. On the other, there’s the beauty of it, the art of creating wonderful flowers and bouquets. That’s something you can’t capture in data. Not even with artificial intelligence? Our main employment of artificial intelligence will be on forecasting the demand to further improve our efficiency. The creative side will still have a human touch to it. As you said, part of Bloomon’s success lies in the fact that it made flowers appealing to young people. This means that it created new consumption patterns. On the one hand, this makes things easier because you don’t have to fight for a piece of the same cake. On the other, it’s more challenging because you have to demonstrate that your cake is actually yummy. How did you deal with this issue? That is indeed an issue that arises when you try to propose something new. As for Bloomon, we relied on a kind-of snowball effect. We had a small group of early adopters that were really fond of the product and this helped to increasingly attract new customers. In addition, we almost had to educate the market on how good flowers look like and why it is a good idea to buy them. As Dutch, this is something we’ve embedded in our hearts. I was indeed wondering what the importance of being a Dutch company is for Bloomon? It’s fundamental. To be successful in this business, you need to be based in the Netherlands. Keep in mind that 50 percent of flowers’ world trade happens physically here. Moreover, it’s a matter of pride. Dutch people were the first to bring flowers indoors in the sixteenth century. Dutch painters started to paint them. It was an incredibly vital industry but at one point it stopped innovating and reinventing itself. We’re proud of how we’re disrupting this industry, still following the steps of a centuries-long tradition. OK, let’s zoom out of the Netherlands. What other markets are you present in? At the moment, we’re present in the Netherlands, Germany, Belgium, UK, and Denmark but we’re about to add a new country that I can’t reveal (yet). What are the challenges of expanding to new markets? It’s a challenge to transfer the company culture from the headquarters to the other offices. It needs to start at the top. So, at the beginning, all managers spend some months here. To feel the vibe, to know how we interact with each other. As you grow, you have to be more explicit about what your company is and what your values are. So we made a list of five items. At Bloomon we act on a greater plan. We test, learn and optimize. Everybody acts like an owner. We spread happiness and we know that we’re better together. What question would you ask the other founders we plan to interview for this series of Growth Stories? I would ask what has been the decisive moment in their company’s evolution. For us, it has probably been getting off the ground: convincing people that investing in flowers is a good opportunity. But I guess that it’s part of the game: if a lot of people see it as a good opportunity probably it’s not a good opportunity. At the very least, there will be a hell of competition. Ola Sars (CEO, co-founder Soundtrack your Brand) would like to know: how do you see yourself in 5-10 years? I see myself trying to fulfill my mission at Bloomon and this entails doing something that is socially relevant. We don’t want to be just a flower kiosk. I wonder how it is gonna play out in the end. Globally, the industry is worth 50 billion and we want to make a mark on that. Raymond Klompsma (CEO, co-founder Srprs.me) asks: what’s the advice you’d give to your 19 years-old self? I’d say: just start doing. Start trying out your ideas, see how people respond and take it from that point onward. Or stop. Don’t be afraid to try. Start. Fail. Start again. Without too much emphasis. Sometimes there are people that come to me and say: “what you have done with Bloomon is really impressive.” But at the end we just had an idea, tried it and ok, it worked. In the lead-up to Tech5 2018 – the annual competition organized by TNW and Adyen which celebrates Europe’s fastest-growing tech companies in the Netherlands, UK, Germany, Spain, France, and Sweden – we’re launching a series of remarkable stories of businesses that experienced extreme growth. If you are a startup with an inspiring/remarkable/interesting story about finding your special metric that led to growth, please share it with davide@thenextweb.com.